The Douglas Aircraft Company was an American aerospace manufacturer, based in Long Beach, California. It was founded in 1921 by Donald Wills Douglas, Sr. and later merged with McDonnell Aircraft in 1967 to form McDonnell Douglas. Douglas Aircraft Company largely operated as a division of McDonnell Douglas after the merger. The Douglas Aircraft Company was founded by Donald Wills Douglas, Sr. in July 1921 in Santa Monica, California, following dissolution of the Davis-Douglas Company. An early claim to fame was the first circumnavigation of the world by air in Douglas planes in 1924. 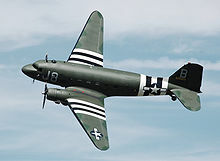 It is most famous for the "DC" (Douglas Commercial) series of commercial aircraft, including what is often regarded as the most significant transport aircraft ever made: the DC-3, which was also produced as a military transport known as the C-47 Skytrain or Dakota. Many Douglas aircraft had unusually long service lives, and many remain in service today. Douglas created a wide variety of aircraft for the United States armed forces, the Navy in particular. The company initially built torpedo bombers for the U.S. Navy, but developed a number of variants on these aircraft including observation aircraft and a commercial airmail variant. Within five years, the company was turning out over 100 aircraft annually. Among the early employees at Douglas were Edward Heinemann, "Dutch" Kindelberger, and Jack Northrop (who went on to found Northrop). The company retained its military market and expanded into amphibians in the late 1920s, also moving its facilities to Clover Field at Santa Monica. The complex in Santa Monica was so large that the mail girls used roller skates to deliver the intra-company mail. By the end of World War II, Douglas had facilities at Santa Monica, El Segundo, Long Beach, and Torrance, California; Tulsa and Midwest City, Oklahoma; and Chicago, IL. In 1934, Douglas produced a commercial two-engined transport, the DC-2, following it with the famous DC-3 in 1936. The wide range of aircraft produced by Douglas included airliners, light and medium bombers, fighters, transports, observation aircraft, and experimental aircraft. During World War II, Douglas joined the BVD (Boeing-Vega-Douglas) consortium to produce the B-17 Flying Fortress. After the war, Douglas built another Boeing design under license, the B-47 Stratojet. 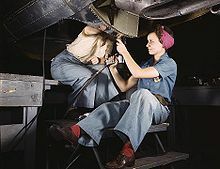 Picture - Women at work on bomber, Douglas Aircraft Company, Long Beach, California in October 1942. World War II was a major earner for Douglas. The company produced almost 30,000 aircraft from 1942 to 1945 and the workforce swelled to 160,000. The company produced a number of aircraft including the C-47 (based on the DC-3), the DB-7 (known as the A-20, Havoc or Boston), the Dauntless and the A-26 Invader. The company suffered at the end of hostilities, facing an end of government orders and a surplus of aircraft. It heavily cut its workforce, sacking almost 100,000 people. As part of their wartime work, Douglas had established a United States Army Air Forces think-tank, a group that would later become the RAND Corporation. Douglas continued to develop new aircraft, including the successful four-engined DC-6 (1946) and their last prop-driven commercial aircraft, the DC-7 (1953). The company had moved into jet propulsion, producing their first for the military - the conventional F3D Skyknight in 1948 and then the more 'jet age' F4D Skyray in 1951. Douglas also made commercial jets, producing the DC-8 in 1958 to compete with the new Boeing 707. Douglas was a pioneer in related fields, such as ejection seats, air-to-air, surface-to-air, and air-to-surface missiles, launch vehicles, bombs and bomb racks. Douglas was eager to enter the new missile business in the 1950s. Douglas moved from producing air-to-air rockets and missiles to entire missile systems under the 1956 Nike program and becoming the main contractor of the Skybolt ALBM program and the Thor ballistic missile program. Douglas also earned contracts from NASA, notably for designing the S-IVB Stage of the enormous Saturn V rocket. Picture - An ex-USAF C-47A Skytrain, the military version of the DC-3, on display in England in 2010. This aircraft flew from a base in Devon, England, during the Invasion of Normandy. In 1967, the company was struggling to expand production to meet demand for DC-8 and DC-9 airliners and the A-4 Skyhawk attack plane. Quality and cash flow problems, DC-10 development costs, combined with shortages due to the Vietnam War, led Douglas to agree to a merger with McDonnell Aircraft Corporation to form McDonnell Douglas. Douglas Aircraft Company continued as a wholly owned subsidiary of McDonnell Douglas, but its space and missiles division became part of a new subsidiary called McDonnell Douglas Astronautics Company. McDonnell Douglas later merged with Boeing in 1997. Boeing combined the Douglas Aircraft Company with the Boeing Commercial Airplanes division, ending more than seventy-five years of Douglas Aircraft Company history. The last Long Beach-built commercial aircraft, the Boeing 717 (a third generation version of the Douglas DC-9), ceased production in May 2006. The C-17 Globemaster III is the last remaining aircraft being assembled at the Long Beach facility, as of 2010. Sobel, Robert. "Donald Douglas: The Fortunes of War". The Entrepreneurs: Explorations Within the American Business Tradition. Weybright & Talley, 1974. ISBN 0-679-40064-8. Douglas Aircraft Company Pictures and Douglas Aircraft Company for Sale.